Gloria likes to drink frequently and copiously. When her boyfriend leaves her and throws her out of their shared apartment at the same time, she ends up staying with Oscar, who also gets her a job at his bar. Several crashes later, Gloria wakes up with a hangover on a playground and later learns that a kaiju, a gigantic monster, is just stomping through Seoul. It takes some time, at least as long as it takes to get sober, but Gloria eventually realizes she is somehow connected to this monster and even its movements correspond to hers. It gets complicated when she divulges her mysterious link with the kaiju to Oscar, who naturally storms out to the playground himself and makes a huge mecha-robot appear. It is safe to say, not even in Seoul is there enough room for two giants. 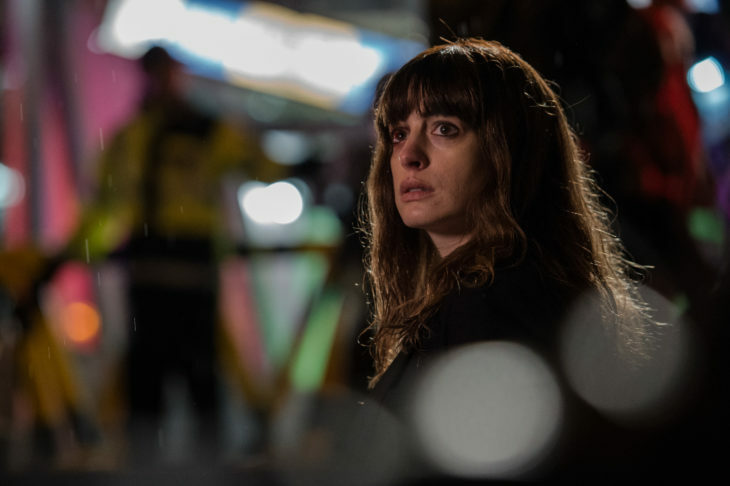 With COLOSSAL the Spanish genre cinema innovator Nacho Vigalondo has made an adorable and quite spectacular fantasy-allegory about what happens when we all give our inner monsters free rein. Note: it’s expensive. After spending her talent in various Hollywood commodities, Anne Hathaway clearly enjoys not only being cast against the grain, but also even embodying a kaiju. Very, very beautiful! There are no online tickets left for this screening. There may be tickets left at the Filmcasino. Waiting list spots for remaining tickets will be handed out one hour before the screening. Cast Anne Hathaway, Jason Sudeikis, Dan Stevens u.a.